Isn’t Wasn’t it an exciting day? Ummm… are you saying you didn’t know? How is that possible? Honestly, priorities are so misplaced these days. Well, there’s no point in wallowing in your shame alone, none of the Palace residents knew about the big event either. But take heart – it isn’t too late to recover your dignity. 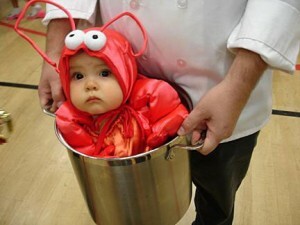 In honor of the Day we are declaring it Lobster Stimulus Day, hoping that if we shared relevant items of a retail nature we might all feel better about overlooking the occasion. We start with the LobsterLine collection from David Wood, an outstanding men’s shop in Portland, Maine. There are several items in the group. Everything is fabulous, especially the pink pants. For men. Sniff. If seeking decor for the cottage, the Lobster Lamp at Newport Nautical is… well, it could be called… whimsical. How’s that? If this doesn’t tickle your taste buds, how about the Lobster Rug at Nautical Rooster? Those seeking personal accessories featuring the crustacean may favor the Kate Spade Lobster bag from her 2007 Cape Cod Collection, still available at some online storefronts. The cost at the places we saw it was about one-third less than the bag’s original selling price, in light of its past-season status. Seeking a smaller investment? A set of two Boatman Geller Lobster Pads is only $38, and that includes personalization. 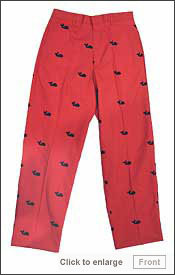 Our next item features a lobster larger than we generally like, but the Men’s Lobster Pants from Bermuda Styles are still cute. One mustn’t forget our best friends when on a quest for proper duds to mark the special day. The Custom Dog Collars, Harnesses and Leashes are all available at our little shop, and they are *very* reasonable, trust TP on this. The pink and blue colorway is also available for these items. And we also offer cute key fobs. At only $5. And you pick the ribbon, and the backing! We hope everyone enjoys celebrating the big day! On a separate note, we hope everyone is able to pop over and send good wishes to Mrs. Newlywed as she undergoes a major medical procedure. “Soon?” Really….? It seems The Princess requires a new definition of ‘soon,’ preferably in cybertime, if you don’t mind. As in ‘cybersoon.’ How long would that be for an online retailer? We’ve been waiting an awfully long time it seems, and there’s still no sign of a functional website. We are beginning to feel like collecting our toys and stomping off to another playground. But we won’t, as that would be a completely inappropriate display of bad manners, and also because there aren’t loads of others carrying the merchandise they stock. J.Crew spokeswoman Margot Fooshee said today in an e-mail without elaborating. “In our eyes, any inconvenience to our customers is unacceptable,” she said. “As a result, we proactively wanted to address them through an e-mail and on our home page, letting them know that they might experience some delays,” Fooshee said, adding that shoppers were notified the company was trying to fix the problems immediately. 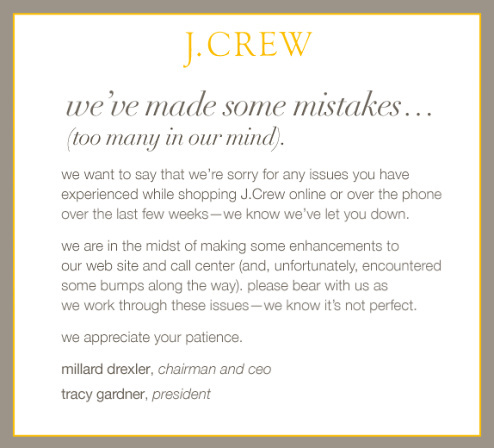 The Bloomberg story does go on to point out that through today J Crew stock has dropped 40% in the last year. Ouch. Another site covering the story is the Consumerist; they have been the recipient of a number of customer complaints. You can see their story here; if the complaints accompanying the post are even half-truths the company has a huge problem to correct. For minute-by-minute updates, there may be no better source than the JCrewAficionada; a fun site worth a visit regardless of your situation with the company. Of course, it is easy for us to be gracious as we haven’t tried conducting any online business with the company. We don’t want to appear insensitive to the plight of any shoppers eagerly awaiting their merchandise, or attempting to initiate (let alone conclude) a return, not to mention any bridal parties possibly ensnared in the nightmare. (Let’s not even go there?!) For it does appear to be a nightmare encompassing every logistical process connecting the niche retailer with its customers, be it order input and management, inventory and supply chain controls, shipping, returns, accounting, call center and customer service ops, you name it – somewhere today it seems we have read someone’s accusations against J. Crew for failing on one or all of these levels. In the language TP learned in B school, this is a complete meltdown. Another ouch! We’re just going to move along to our next story, an update on our post about the $150,000 Goyard Trunk with all fifty issues of Visionaire magazine inside. You may recall that we briefly mentioned the upcoming issue would honor Lacoste because this is their 75th Anniversary year. Each issue, which costs $250, will include three polo shirts from the collection (in small, medium and large) and all 12 images from the contributors, contained in a shiny large, white box that looks more like a suitcase. We find the price for the magazine surprisingly low, considering what other issues have been priced at, even more so when comparing that $250 magazine cost with the approximate expense for three Lacoste polo shirts. If you assign an approximate value of $80 retail and multiply that by three, the result is $240, just about the price for the magazine. The magazine’s proven value as a collectible combined with the presumed allure of three Limited Edition Lacoste shirts would hypothetically increase the value of those pieces far beyond the $250 cover price for this edition of the magazine. Surprising. You know, it is possible shoppers are becoming jaded by all of the Limited Edition and Anniversary merchandise out there, it just goes on and on for so many different things…hhhhm. Actually, there is quite a bit of the 75th Anniversary Collection on sale, at least online. For example, the Ladies 75th Anniversary Short Sleeve Exploded Croc Piqué Polo is on sale (below left), as is the Men’s Graphic Logo T-shirt (below right). 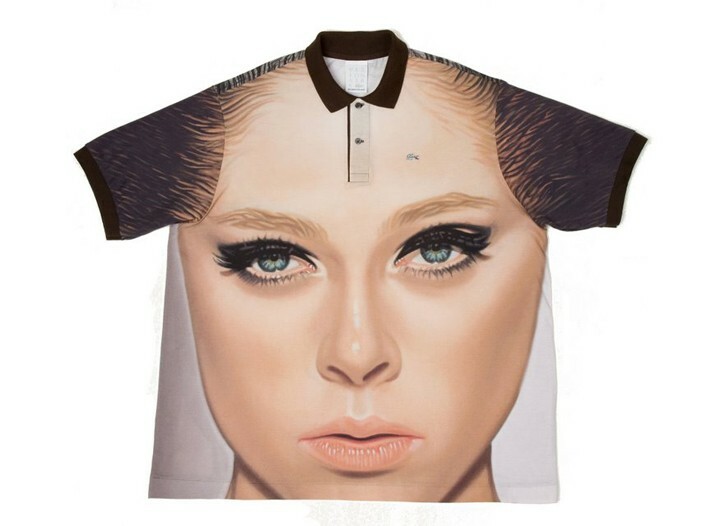 Here is a good shot of Coco Rocha on one of the Lacoste polo shirts, compliments of Visionaire. The printing process must have been extraordinarily meticulous, as it looks like the shirt has been hand-painted. A little housekeeping here, because The Princess was amazed to discover she had been graced with a Brillante Weblog award! Our own Little Bow Prep surprised us with this, and we offer our humble “Thank You” for such lovely recognition, undeserved as it is! Because TP believes that we truly keep only that which we give away, we send this on to Mommypie, Techyness, Misadventures of a Newlywed, Mamalicious, Fashion Herald. There are many more also deserving of the award (just glance at our Blogroll! ), but they have already been recipients so we won’t ‘double-tag’ them. Oh, to be agonizing over the distinctions between Martha’s Vineyard and the Cape, at least in the summertime. 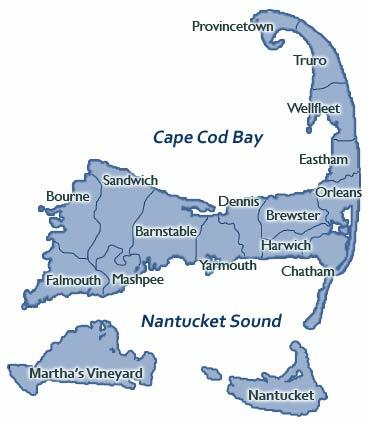 The two islands *are* different, but not to the extend Boston Globe reporter Jonathan Levitt details in a story about his first visit to Nantucket. “A Hostel Guy in a Lilly Pulitzer World” chronicles Levitt’s trip to the island, but at at times his perspective sounds more like a teenager making snarky comments about a schoolmate than it does the work of a seasoned travel writer covering a vacation spot. The village looks like the centerpiece of a living history museum or the campus of a small New England liberal arts college on parents weekend. Everything is scrubbed and blooming and preserved in the glory days of pre-traffic lights and pre-asphalt and pre-chain stores. And there are shops, but it is not a place to look for what you need, unless what you need is Lilly Pulitzer, or a $700 fishing reel, or an oil painting of dunes and breaking waves. The people that I see look alike (tall and tan and blond and lovely) and are dressed similarly in a sort of Nantucket uniform, a specific, preppy, just-woke-up-from-a-nap-on-the-wooden-sailboat look. For men it’s a collar-up polo shirt in soft fruity colors like periwinkle blue and Bermuda sand pink (actually called Nantucket Red), longish almost to the knees shorts or straight-front pants with a pattern of lobsters or whales, a cloth belt embroidered with more whales or classic sports cars, leather loafers or boat shoes without socks, big waterproof sailing and diving chronograph watch, gold wedding band, and the haircut, long enough for conditioner but short in the back and around the ears. It’s the Hermès Cape Cod 1928, a limited edition watch released last year (as best we remember). Pricey? Yes. Elegantly understated on a gentleman’s wrist? Absolutely. Now since we’re on the Hermès topic, and because The Princess does consider her pursuit of Extreme Gardening a new sport, we thought the Hermès Gardening Tools might be a set we need to add to our collection out in the Gardener’s shed. You know the one. The group of tools the Head Gardener hovers over protectively whenever we approach; what does the man think we’re about to do with them? 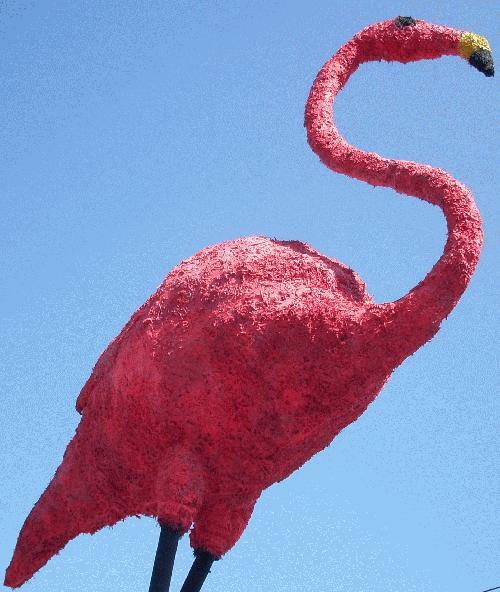 We think he’s just bitter because we insisted he have some of the animals in the topiary spray painted pink. The flamingos. Here’s a better shot. I really don’t understand why he has a problem with it; there are only 40 of them on the property, and the landscaper brought people in to do the actual work. Something about “not natural.” We’re thinking he needs to get over the “not natural” issue. In a hurry. Lest he find someone else in charge of the green thumbs at the Prepatorium. Preppy Vampire Weekend Going Goth for Cape Cod? At any rate, their current music video, Oxford Comma, again shows them in their standard fare of buttondown shirts, polo shirts, chinos, jeans, and even a cardigan sweater. The über-preppy former Columbia students worked on their next music video over the weekend and apparently this one is a little different thematically from the previous three. The song they are doing the video for, Cape Cod Kwassa Kwassa, has lyrics referencing Louis Vuitton and Benetton, among other things. “the longest shoot we’ve done” — they were decked out in standard-issue VW gear: Polo, Lacoste, Sperry. Even I rocked J.Crew threads. But not for long. Quite the look, don’t you think? If you are not familiar with the lyrics to the song, here they are, compliments of MetroLyrics.com. Should you desire ringtones, hypothetically you acquire them free at the site. 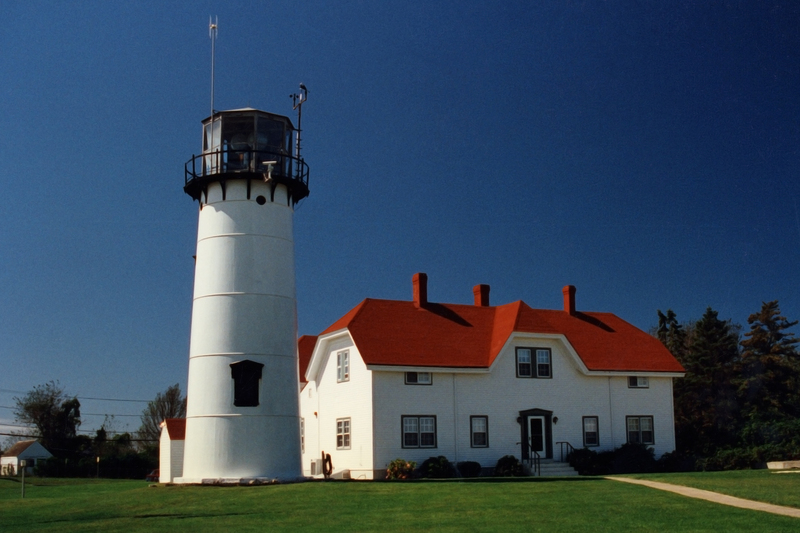 C’mon, P-town, Wellfleet, Hyannis — get it together! All we can tell you is its name, the Beatle, and that it is available in four colors: fuchsia, black, lime, and orange. It also comes in four different sizes. The Princess is absolutely transfixed by it. Translated? Whilst in the big city by the large lake this week we may need to go hunting for it and its siblings. There is nary a word about the material from which it is made in the non-descriptive description on Benetton’s site, so really, we’re merely going on an investigatory mission. Nothing more. Honest.